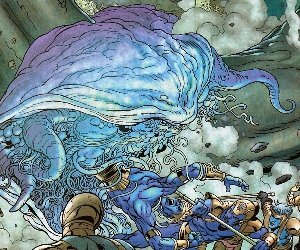 Powers/Abilities: An amorphous electrical being capable of operating in both air and water, Man-of-war had tendrils that could deliver powerful shocks and temporarily paralyze their victims, a consistency capable of absorbing mighty blows, and a body capable of ingesting human victims. History: (Fantastic Four Unlimited I#11/2 (fb) - BTS) - After the city of Atlantis was raised to the surface, it formed a new island that the Portuguese government sought to claim. They marshaled their forces to the island, and created the deadly Man-of-War in case any superhuman opponents opposed them. (Fantastic Four Unlimited I#11/2) - As Ambassador Catarino declared Portugal's intentions to the United Nations, the Portuguese forces settled the island. They opposed mounting forces of British researchers, the United States Marine Corps, and armed operatives from Roxxon Oil. 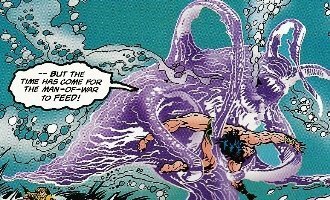 As the various armies began battling, Namor arrived and began breaking them up until Man-of-War was deployed to fight Namor. Man-of-War stung Namor, paralyzing one of his sides, then shrugged off Namor's blows. 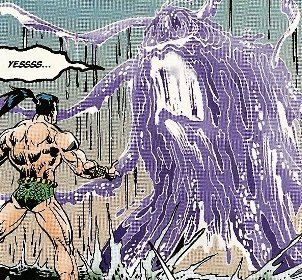 Continuing the battle underwater, Man-of-War prepared to ingest Namor until Namor fired a vibranium gun that seemingly dissipated Man-of-War's form. Namor subsequently attacked the battling armies on the surface, sending them fleeing. 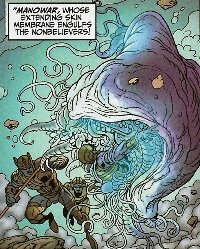 (New Thunderbolts#3 (fb) - BTS) - Taking upon themselves the name of At'La'Tique, an ancient Atlantean phrase meaning the 'Fury of the Sea,' the religious rebels followed various leaders, including Nagala, Shakkoth, and Tamara Rahn. They formed a strike force called Fathom Five, which included Dragonrider, Llyron, Bloodtide, Sea Leopard, and Manowar. At'La'Tique's primary religious beliefs involved wiping out life on the surface world. To achieve this goal, they formed an alliance with Baron Strucker of HYDRA. (New Thunderbolts#1) - Fathom Five attacked New York City and began engaging in rampant destruction. Manowar attacked Blizzard of the Thunderbolts until Songbird knocked him aside. Fathom Five soon retreated. (New Thunderbolts#5) - Bloodtide drove Warbird into Manowar's grip, and Manowar defeated Warbird with an electric charge. MACH-IV (dressed as the Beetle) knocked Manowar from the air later. (Avengers VIII#9) - Namor recruited Manowar to join his new super-team, the Defenders of the Deep, including Andromeda, Bloodtide, Echidna, King Crab, Namor, Orka, Tiger Shark, and several mutated Piranhas. (Avengers VIII#10) - The Defenders of the Deep and War-Sharks saw Namor raise Hydropolis to the surface, then attacked the humans within, declaring that all on the surface world were no longer allowed under the ocean. The Avengers (Black Panther/T'Challa, Captain America/Steve Rogers, Captain Marvel/Carol Danvers, Ghost Rider/Robbie Reyes, Hulk/Jennifer Walters, Iron Man/Tony Stark, Thor/Odinson) attacked, and Manowar and Andromeda attacked Captain Marvel. Soon the Winter Guard (Chernobog, Crimson Dynamo/Dmitri Bukharin, Darkstar/Laynia Petrovna, Perun, Ursa Major, Vanguard/Nikolai Krylenko, Vostok) intervened, and fights broke out among all three teams. Crimson Dynamo hit Manowar with a series of blasts, leaving a hole in his center. In the chaos, Namor killed a few of the Piranhas for hunting humans, then he ordered the withdrawal of the Defenders of the Deep. Comments: Created by Glenn Herdling and Herb Trimpe. Man-of-War was given no clarification on origin except to specify that he was created. It is unknown if he is human, mutant, or scientific creation gone awry. Kurt Busiek and Fabian Nicieza confirmed the FF Unlimited and New Thunderbolts characters to be the same. any other "Man" or "War" characters. 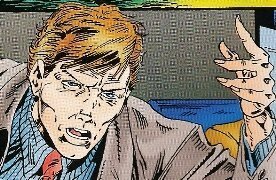 (Fantastic Four Unlimited I#11/2) - Ambassador Catarino, representing the Portuguese government, laid claim on the newly raised land of Atlantis at the United Nations general assembly. He announced that any attempt to claim the land by any other country would be considered an act of war.